Yesterday I finally spent a few hours in my apartment not sweating profusely & came to the conclusion, fall might really be here. I know that heat wave was a few knotches over the top, and I love the seasons transitions, but I hope we can maintain a happy warmth for the coming weeks. We are sorry the Jamie Kennedy Fries didn’t attend last week, but are hopeful weather permitting they are here this Tuesday! We are still rounding out our food vendors for the remainder of the season – more to come as soon as we make some confirmations. 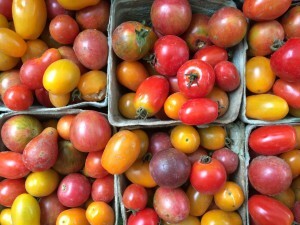 Haystrom Farms has many fall fruits including watermelons, cantelope, ground cherries & tomatillos. Salads don’t have to end along with summer – Organic Vibes has great salad starters – mixed greens & cucumbers. P & H Farms table is always brimming with beautiful colours. This week they will have bitter melons, celery & carrots. Don’t pass by Ken from Life Spring Beyond Organic Farm because he has your idyllic fall veggies coming in – root veggies, squash & kale. Frog Pond Organic Winery – Ontario’s first ever certified Organic winery – is joining the market this Tuesday. They utilize sustainable practices in all aspects of running a vineyard and winery, including being bullfrog powered. Click on the link for a great video about their winemaking. Brian CC Sasaki may be remembered from the opening day of the market. He is coming back with more wonderful melodies and whistling tunes! Because tomato season is slowly coming to an end (yes, I am just as sad as you are) we thought our recipe this week would feature a simple to make, spicy tomato sauce recipe from Greatist.